With the not-unexpected announcement that the WMSC have called McLaren to account for their behavior in the Melbourne stewards meeting, to be heard on April 29, speculation erupts as to how stiff a penalty will be imposed, whether Hamilton will be induced to change teams, the possibility of Whitmarsh resigning and whether Mercedes will switch their support to Brawn GP. Naturally, there is no thought that the court will adopt the wisest course by accepting that the matter has been blown out of proportion and that there is no need for any further action. That in itself is an indication of how the WMSC is viewed in general; its previous judgements are so suspect that no one suggests for a moment that it might do any better this time. But I think the consensus might be wrong in this case - there is an unnoticed factor that could have more than a little influence on the matter. I speak of Mercedes' position in the furore. Some are suggesting that the company might drop McLaren as its main investment in F1, transferring its effort to the team of the moment, Brawn GP. Yet this is highly unlikely, given the fact that Mercedes owns much of McLaren; that is an investment that cannot be changed overnight. It is true that patience must be wearing thin with both McLaren's sparing successes in the constructors championship and the team's constant stumbling into battles with the FIA. A much more likely response than switching allegiance is that the company withdraw from the sport altogether. It has been pointed out that Mercedes is losing vast sums of money in its production sales at the moment and this could be just the excuse the company needs to cut its losses in F1. If the WMSC had any sense, it would have seen this possibility looming and done its utmost to play down the unnecessary storm over the fiasco in Melbourne. That is too much to hope for, apparently, but it does not mean that Mercedes will take things lying down. Just a quiet threat to withdraw should be sufficient to give Max Mosley pause (and he is the WMSC, after all). 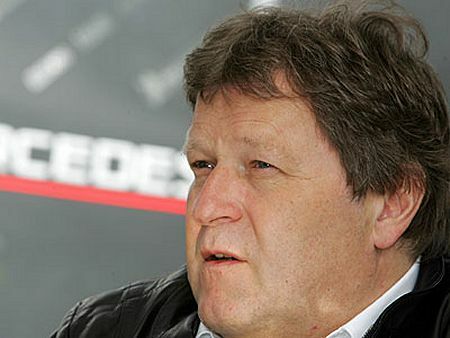 Consider what the FIA would be confronted with: not just one team withdrawal but three, since Brawn and Force India could not continue without Mercedes engines, crisis on the standard ECU front as supplies dry up and collapse of public interest in a championship deprived of its most exciting team (Brawn GP) and driver (Lewis Hamilton). Bernie would have a fit. There is no need for Mercedes to do anything in public; a word in Mosley's ear should get the message across - "put an end to this or we take our ball away". Surely even Max would see how his actions have endangered the future of F1 and the word would go out: drop the case. Of course, this is F1 and so anything can happen. All I can do is register my objection that so much has been put at risk by so petty a pursuit of a team that has done no worse than tell a stupid lie to a bunch of incompetent stewards. If this is the way F1 is run, I suggest that Mercedes should go ahead and hold the sport to ransom; as unseen manipulators behind the scenes, they can do no worse than the idiots presently running the show. Agree with the main thrust of the article in that this whole charade has gone way too far; to even consider Max, Charlie, Donnelly as some kind of paragons of fair play is just laughable. I suppose the point why Max manages to get away with with this infantile pursuit is perhaps more to do with the inherent lack of unity within FOTA and frankly the rather emotional and intellectually challenged fans. KP: And I agree with you, except that I would be kinder to the fans. Generally speaking, they are a far more sensible bunch than Max, Bernie and their cronies and could do a much better job of guiding F1 into the future. Most of the changes made to the regulations this year, heartily approved of by so many, have been asked for by the fans for years. He, you sure are pissed off at this Clive! But you're absolutely right, this is nonsene (a byword for FIA) and has been blown totally out of any rational proportion. It's infantile and mental. Worse, it's shameful and ridicuolus. As much as I'd hate it to happen, I'm hoping Merc grab his bags and do away with F1, perhaps then the remaining teams would wake up and revolt, break away, kidnap Mosley... or whatever it takes to shut down the FIA. Number 38: Thank you - always good to get a ditto from you! Haplo: You're a revolutionary, Haplo! But you're right - the antics of the the Max and Bernie show are enough to drive us all to distraction. If anyone is bringing the sport into disrepute, it is them. Yes, especially because this is not a regular sport (as any motor racing sport)... This is about winning and interpreting the rules your own way, and lying too, and cheating. I'd bet good money that any other team would probably do the same in a similar situation... A point is a point, and after all it was a white lie. As far as I can see, there is nothing that prohibits what McLaren did. It was morally wrong and it deserves to feel a certain amount of heat from those who watch and support F1, but the rulemakers have no theoretical scope with which to punish it themselves. Even the disqualification from Melbourne was ultra vires - all they were empowered to do was to restore Trulli to 3rd place (since his penalty was no longer justified) and tell the world what had happened, preferably supported by full transcripts of what happened in the stewards' meeting as well as the relevant excerpts of radio. I expect that, whatever else happens to McLaren, there will be a fine of at least $4m. This is because the FIA, having had its funding gap revealed by the drivers, are likely to see this as an opportunity to close that gap. I also can't see how McLaren can escape some of the charges due to the way they are worded (I may disagree with linking the alleged events with Article 151c, but that's not going to sway the WMSC one iota). Losing three teams would simply cement Max's power. He will argue that this is because one team chose to break the rules (even though it didn't) and say the over-dependence on one flighty manufacturer gives more power to his vision and the self-contradictory actions he wishes to take under the cover of getting there. I agree totally Ali. The WMSC has become rather famous for creative interpretation of the rules. Max of course can twist anything to his advantage. Personally, I would whisper in Bernie's ear as he is more likely to see the consequences of a Merc withdrawal than Max. I will repeat once more, in any major American series, either team could have appealed to the race steward and gotten an immediate answer, the cars would have been realigned before the finish and no more would have been said. This really does stink of Max (as you pointed out, Clive, "he is the WMSC, after all"). I love that Alianora can state so definitively what the WMSC is empowered to implement as a punishment. If only they would read their own rules. It is a wonder to me that they see so much grey area regarding the reach of their jurisdiction yet see only black and white with regard to competitor's behavior. But the real mystery is the fact that WMSC has an unwritten code regarding a team's reaction to rule infraction. If a team makes all the right moves after WMSC has identified an infraction, then the team may be forgiven. Take Renault's lack of punishment in their spying scandal. They immediately acted contrite, as did Hamilton when the ax seemed to be falling. Both escaped harsh punishment. It appears the WMSC wants those who are accused to admit guilt without argument, mea culpa. Any argument or reticence to admit complete culpability or call attention to a grey area in the rules, results in further sanctioning. This is no way to govern a sport. by waving the pitboard in front of the timing beam?? Here Here, well said...I fully expect the FIA to totally screw this up, they have turned a mole hill into a mountain...the stewards should have reviewed ALL of the radio traffic etc before firing from the hip as they did in Melbourne typically incompetence on their part..when is this multi billion dollar sport going to get professional....if anyone is bring the sport into disrepute it is Max and the FIA.....as they say power corrupts, absolute power corrupts absolutely.....isn't that right Max! Good call Rob. It was Max's partner Robin Herd who did it although I am sure many have done exactly the same thing. If the organisers were dumb enough to place the timing beam in an area where people were swinging pit boards it was bound to happen. Alianora: You're probably right about this being an excellent opportunity for the FIA to see to its cash shortfall. But when I say "Max", I mean the two of them of course. It would be Bernie who would ensure that Max see reason, yes. Marc: Agreed. It seems the greatest sin of all is not to bow and scrape to the FIA. Does anyone think that this is some sort of witch hunt by Max, possibly in a effort in trying to identify those involved in the "setup" of what became Mosley-gate? This is a waste of time, as much mine as the FIA's. Stuart: Oh, Max knows all about power, certainly. Which makes him an expert on corruption too, doesn't it? Steven: Thanks for the ditto. And for the memory of Brambilla - a huge character from another age, a time when F1 could be fun as well as competition. If Mercedes threaten to withdraw, Max can threaten to sue, just as he wanted to with Honda. But with 3 teams now, he can make it very public and very ugly for Mercedes. If Max will go down, he'll take down Mercedes with him. And that's something Stuggart can't afford. They'd probably back out of their threat, support Brawn for 2009, and quietly order McLaren to focus on 2010 instead if things don't work out by Silverstone. Another ditto from me Clive. The problem though as I see it, is that S&Max is clearly so irrational that you can't predict what a few quiet words in his ear will do. Might blow up in even grander fashion than we are currently witnessing. Someone else said the whisper would be better going into the poision dwarf's ear, which I agree. But does the poison dwarf have any influence anymore over S&Max? Is the puppet now controlling the master? I could not agree more. In fact I would go further and say that they Disqualification of Hamilton was also the wrong decision. Mclaren did not cheat, they lied but did not cheat. The Stewards must have looked at what they saw at Melbourne and thought that Trulli overtook Hamilton without making sure that the Mclaren was in trouble. Button slowed many times trying to gain some distance between him and the safety car yet no one took it upon themselves to overtake him. The radio conversation was therfore of no relevance at all. Trulli showed that he immediately thought he was in the wrong as he straight away slowed to try and let Hamilton re-pass, however hamilton decided to stay behind and not risk a penalty which ironically led to a penalty anyway. Hamilton and Mclaren should have simply been handed a fine for unsportmanlike behaiviour, however did schumacher ever get punished for risking Damon Hills life by purposefully ramming him? The other thing that grates is that I could swear Ferrari deliberatley mislead the FIA stewards in regards to their flexible floor last year in melbourne. I am pretty sure they tried to hide it from the scrutineers initially. However they suffered no punishment at all. This does not however exuse the stupidity of Mclaren in telling lies in the first place that were so easily exposed. As for Mercedes threatening Max, I do not think this would work as Max has shown that he has no regard for F1. He would take the sport down with him if he possibly could. Bernie would too as can be seen in the fact that he has effectively stole money from Mclaren and Renault and when they threaten to boycott he tells them he will cancel the whole race. Bert: I couldn't agree more - a total waste of everyone's time. And I'm quite sure that Max is influenced by his suspicion that McLaren had something to do with his own fall from grace last year. He keeps going back to it, while the rest of us are trying to forget the image of his bare backside being smacked so ignominiously. Journeyer: If it were just Max, I agree that he would tear F1 apart rather than back down on his petty vendetta. But such disruption would be too much for Bernie to bear and he would persuade Max to see reason, I'm sure. Threats to sue are one thing but actually doing so is another. Since there is no Concorde Agreement in place (regardless of which stance the teams and the FIA take at the moment) it is extremely debatable as to whether Mercedes are contracted to take part in F1. It would take years of litigation even to establish whether they are and the FIA cannot afford that. This morning I see that things are beginning to move towards the scenario I suggested. Haug has pointed out that he will have to consult with his boss, the CEO of Mercedes, if things become impossible and there is a meeting of the board scheduled soon. Others are starting to realise how big an impact a Mercedes withdrawal would have too. My point is that the FIA should not be playing with fire over such a petty matter anyway. Mercedes may decide once more to stay in the game in spite of yet more humiliation - but there is just no way the governing body should be endangering the sport by giving Mercedes an excuse to leave. When this is over, let us remember that it was started by incompetent officials and the results will be courtesy of an incompetent governing body. Peril: Good question indeed. Maybe this is the showdown that will give us a final answer on who really runs the show, the miser or the megalomaniac. Lee: You are quite right about the movable floor. The whole point was to evade the measurement devices used by the scrutineers while retaining the ability for the floor to flex. It was clever but much more dishonest and cynical than McLaren's silly little lie. I think Bernie would see how a Mercedes withdrawal would affect CVC's income disastrously. Take McLaren, Brawn GP and Hamilton out of the game and the bottom would fall out of TV ratings. The advertisers would soon follow. I suppose it is ironic that we end up relying on Bernie's greed to hold back Max from his destructive impulses. F1 is a soap opera. The writers know if there is no dirt, the ratings go down. It's all about $$$$. The show must go on. Let's not expect the carnies to be ethical. What goes on on the track has become quite secondary. If it doesn't fit the script, there are many ways to rewrite it, to prepare the next instalment of the ongoing serial. The giant money generator keeps on turning and filling Ecclestones pockets. I have come to the conclusion we should all watch the races, ignore any commentary, and keep score in a little black book by the TV. If we don't like what we see, we will invent our own scenarios and hand down our own fines. We'll use Monopoly money. That's it!!!! Let's turn it into a board game!!! Absolutely right. Was it you who wrote that brilliant comment about Hasbro sponsoring F1, Nick? I think I forgot to answer it at the time but it was sheer genius. It so perfectly illustrated the war between racing and entertainment that has gripped F1 for so long. Unfortunately and thanks to Bernie, entertainment has won nearly every battle so far. Mercedes will not withdraw for one reason - BMW is still around. It would have to be a financial reason for Mercedes to pull out in spite of that. Also, there is the court of public opinion. Knowing Max, he can twist a Mercedes withdrawal in such a way as to make them look like Honda, or worse, GM. Again, can Mercedes afford this? At least their engines are still winning - and that's the bottom line. So long as Brawn are winning, Mercedes will stay in. All this * boils down to one thing in my view. When Hamilton appeared onto the F1 stage he was sold to us as the best prepared driver in history of F1. That he knows the rules book inside out. He showed us that when he remained in his car once off the track and had it tugged back to continue his race I believe it was Nuernberg GP. He showed us that again when he rightfully announced he would not have to let Trulli take back his position because he was off the track. It is those IDÍOTS at McLaren who knew nothing - panicked let a great racer out to dry and then - in Hamilton's trust - led him to this calamitous procession. McLaren should have made sure that every single man on the pit wall knew the rule book inside out. And that if not - they should just give Lewis his free will back so that he can make those decisions as he would have and not rely on pathetic ill prepared control freaks i regards to the rules book. Now that is how angry I am at all this. Hello to you Clive great read wish you a happy easter weekend !!! P.S. any one with an idea as to wether the Brawn GP would be as successful with an Honda engine at the back? I mean ... maybe Honda did know more about their true potential and decided to withdraw? :-) sorry I just had to get that one underway. happy easter all. Journeyer: I really don't go for this "so-and-so won't pull out unless such-and-such does" argument. They said that about Toyota when Honda left, yet Toyota are still in there punching. And it is even less likely in Mercedes' case. They were in F1 long before BMW and, although I'm sure BMW would like to see themselves as serious competition for Mercedes, they really couldn't care less about the little Bavarian company. They are Mercedes, the oldest and greatest German car manufacturer and way above noticing such upstarts as BMW. No, it's hard financial reality that will cause Mercedes to back out and they will welcome such an excuse as unfair treatment by the FIA - what an easy way to deflect attention from their cash flow problems! The stage has been set and it may be this time that Mercedes takes the opportunity. Max can twist things whichever way he wants and it won't make an iota of difference to Mercedes; if they decide to go, they'll go and nothing Max can do will stop them. They know he is the object of the world's derision anyway and they would be well rid of any association with him. But you're right that the fact that their engines are winning will be one factor they will take into account. It just might not be enough to offset the reasons for leaving, however. Strange Rules: And a happy Easter to you too! Actually, I think the guys at McLaren do know the rulebook inside out but they were caught out because the rules do not cover the incident in question. Lewis thought he was okay because Trulli had gone off the track; the team was not so sure, bearing in mind how every interpretation by the stewards had gone against them in the past. They were playing it safe, understandably in my opinion. And let us not forget that we do not know that the stewards would not have penalised Hamilton had he not let Trulli through; going by past performance, that is exactly what they would have done. Where the team got it wrong was in lying to the stewards about letting Trulli through. That was unforgivably stupid, I grant you. As regards Honda's withdrawal, I am still convinced that it was a financial decision made by guys who could not care less about F1. Some within the company may be regretting the decision now but the accountants are still happy - they wanted to save money and they are achieving that object. It is true, too, that the Brawn BGP 001 might not be so good with a Honda engine in the back. If there is any truth in the rumour that the Honda was not as powerful as other engines, that would certainly handicap the Brawn. But I cannot see why Honda would not have done a Renault on the crowd and get the FIA to let them spice it up a little. Honda's engines have always been good and their engineers could easily get a little more power from it if they wanted to. So I doubt that Honda withdrew because they knew the new car would not be a race winner because their engine was duff. Purely an accounting matter, that's the way I see it. "Where the team got it wrong" is by talking to the stewards at all. Why bother? "They said that about Toyota when Honda left, yet Toyota are still in there punching." ...for now. Let's see how things go at the end of this year, especially if Toyota don't win a race. "They know he is the object of the world's derision anyway and they would be well rid of any association with him." But if Max indeed sues them, they get tied together by association again in the headlines, for better or for worse. As it is, Max and Mercedes are directly tied together right now, but a court case would change all that. "And let us not forget that we do not know that the stewards would not have penalised Hamilton had he not let Trulli through; going by past performance, that is exactly what they would have done." France 2002 - Kimi went off, Schumi passed him, no penalty for Schumi. That alone should be enough for precedent. "Purely an accounting matter, that's the way I see it. " But I thought Honda was a racing company that so happened to make cars? I'm not sure if what they did is consistent with Soichiro Honda's ethos. Toyota are known to be contemplating withdrawal if they don't win a race this season. But that has nothing to do with the participation or otherwise of Honda, which was your original point (Mercedes staying in because BMW are still there). If Toyota leaves, it will be because their expenditure has been far too great for the meagre results obtained. As I said before, Max may threaten to sue but he will not do so if it comes down to it. The litigation involved would be so lengthy and expensive that the FIA could not support it. The FIA has demonstrated time and again that precedent counts for nothing with them, especially where McLaren is concerned. The initial stewards' decision in the Hamilton/Raikkonen incident at Spa last year ignored precedent in refusing to accept that Hamilton had allowed Rakkonen to repass - instead, they introduced the subjective issue of whether an advantage gained had been returned. Then, in the appeal to the WMSC, the court ignored the precedent of a previous appeal against a 25-second penalty being heard and refused to hear McLaren's case. Honda departed from its racing roots the moment that it started mass-producing road cars. Once a company is that deeply involved in huge expenditure, the balance sheet becomes more important than any desire to go racing or high-flown ideals. Honda is like any other manufacturer - it will not race if it cannot afford it. Only small specialist manufacturers will compete to the point of bankruptcy; and Honda ceased to be a small manufacturer long ago. Spot on Clive. Precedent only comes in to play with the FIA when it is additive to their position. When it is not, there is no mention. Regulations loosely written bolster the position as they can interpret and re-interpret whenever and however they see fit. Insulting to say the least.